Miso shiru is a Japanese soup that can be served in any Sushi meal. The soup consists of a seaweed and bonito stock which is called Dashi mixed with Miso paste. 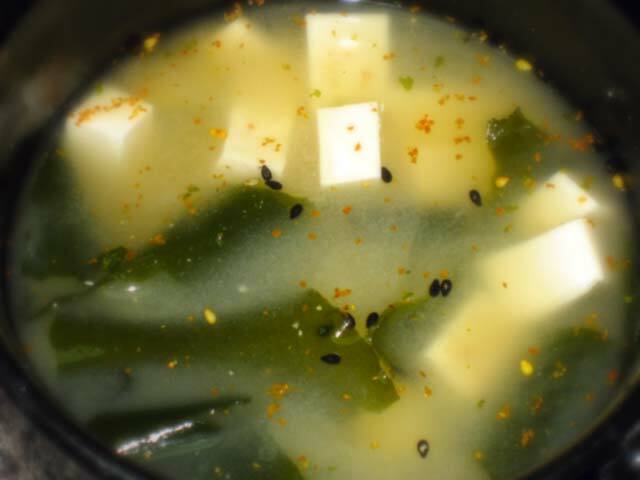 Traditionally Miso soup is one of the most common breakfast dishes in Japan. When it is part of another meal, it is usually served at the end. The soup can be accompanied by other vegetables, mushrooms, and tofu. Fish can also be added. It is a very nutritious meal since it has a high protein and high fiber content combined with a lot of vitamins. It is very low in calories so it can easily be a good diet food. The only problem that stops it from being the perfect meal is that it also contains a large amount of sodium. The characteristic flavor of this soup it is something that is hard to define. The Japanese say that the flavor is called umami, which they propose is the fifth flavor type to accompany salty, sweet, bitter, and sour. Seawead is one of the food that has the highest umami content. Other food with umami are beef, lamb, and soy sauce. Umami is sometimes refereed as savoriness. Children tend to like umami flavors because they remind themselves of mother’s milk which also has a high umami content. The ingredients will not be found in a regular supermarket but rather found in an asian market. It is Sushi Friday, so here is my recipe for another great Japanese dish. Add water, wakame and dashinomoto to small sauce pan. Warm the soup but do not let it boil. Dice tofu into small cubes and add to the soup. Remove a 1/4 cup of liquid to a heat resistant cup. Mix in the miso paste with the water until the miso is dissolved. Add the dissolved miso to the soup. Mix the soup. Garnish with finely cut up chives, or Shichimi Togarashi (japanese chili powder). Optional – You can also add other vegetables, mushrooms, cooked shrimp or fish to the soup.